Anyone who's ever opened an image in a text editor knows that if you move anything around or insert new text, all bets are off. 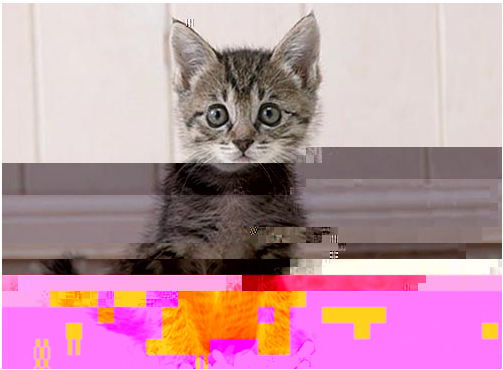 Image algorithms are usually pretty fault tolerant, but if you touch the right bytes, you get something like that tragic kitten. That's fine for the desktop - but what if you want to do the same thing in the browser? The other week I suddenly found myself yearning to be able to take some arbitrary image and iteratively damage it until it looked crazy. It uses Base64 Data uris for displaying the result, so it doesn't have to touch the filesystem or overwrite the initial image. If it sounds like something you might be interested in, check out the demo or browse the code on github.